VersaLogic's Tetra is a power-efficient, quad-core single board computer that is said to be ready for off-the-shelf deployment into demanding industrial applications requiring rugged, long-life, power-efficient, and industrial temperature rated (-40° to +85°C) capabilities. Photo courtesy of VersaLogic/PR Web. TUALATIN, Ore.–VersaLogic Corporation (www.VersaLogic.com) has introduced a new line of production-ready, Arm-based embedded computers starting with the Tetra, a power-efficient, quad-core single board computer (SBC). Featuring a quad-core i.MX6 Cortex®-A9 32-bit processor, a Tetra typically consumes about 4W of power when operating (not idle). It is ready for off-the-shelf deployment into demanding industrial applications requiring rugged, long-life, power-efficient, industrial temperature rated (-40° to +85°C) capabilities. Unlike many Arm-based "modules," VersaLogic's new line of Arm-based EPC (Embedded Processing Card) products are complete board-level computers. They do not require carrier cards, companion boards, connector break-out boards, or other add-ons to function, according to VersaLogic. For ease of mounting, and future upgrades, VersaLogic's Arm products are designed around the size and mounting points of COM Express products. 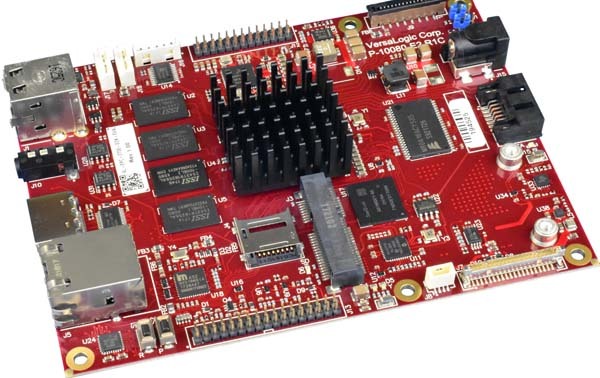 Unlike proprietary-format Arm products, VersaLogic Arm boards provide a standardized mounting pattern now, and simplified upgrading in the future, the company said in a press release. The Tetra is COM Express Basic size (125 x 95 mm) and offers a variety of I/O options for rugged, industrial applications. The three quad-core Tetra models feature a wide (8 to 17-volt) power input, making it well-suited for 12-volt automotive applications. Many applications that require lower power or lower heat dissipation still need very high levels of reliability. VersaLogic's 10-plus year formal life-extension program is said to ensure long production cycles, free from expensive changes and upgrades that come from short, disposable lifecycles. CAN Bus, I2C, and SPI are also included, along with a 6-axis e-compass and MIPI camera input. The on-board Mini PCIe socket is reported to provide flexible expansion using plug-in Wi-Fi modems, GPS receivers, Ethernet, Firewire, and other mini cards. Designed and tested for industrial temperature (-40° to +85°C ) operation, VersaLogic's rugged Tetra meets MIL-STD 202G specifications to withstand high impact and vibration. It is "engineered and validated to excel in unforgiving environments," VersaLogic said. Each component is said to be carefully selected to ensure reliable operation in the field.